A series of lower back injuries, culminating in a torn sacroiliac ligament that came from lifting a student off the floor, reinspired my own relationship with twisting poses. As I healed from that injury, I found that twists were the most effective poses for releasing that area in my body, even though twisting poses are often considered potentially hazardous to the S.I. joint. This is an example of how my inner experience was different from the common wisdom of other teachers. This disconnect between the words of the teacher and the inner experience of the student is important to understand. One challenge in teaching yoga is empowering students to discover their own abilities and limitations. 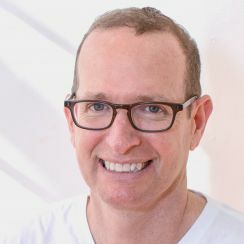 This is especially important in teaching yoga to people with disabilities and chronic illness, where students may feel disconnected from their bodies or disempowered to make decisions about their bodies. Each individual is unique in their ability, as well as in the way that a given disability or illness manifests in their body. To address this, students need to be empowered with information as well as authority over their own bodies. For example, this means that rather than following an instructor’s timing in a pose, students are encouraged to practice at their own pace and to come out of a pose early or stay longer. As teachers, it’s important that we consider a range of variations of the poses that we teach so that students can find the ones that works best for them. Here are some accessible twisting pose variations to explore. In all twisting poses, it’s important for students to continue lengthening the spine as they twist, following the instruction to “Inhale lengthen, exhale twist” to guide their movement. If a student has a pronounced kyphosis (rounding in the upper back) or scoliosis (curve or twist of the spine), it’s helpful to focus on lengthening rather than twisting. In these conditions there is a different relationship between the individual vertebrae, and a deep twist could be counterproductive. Twisting poses can be practiced sitting in a chair. To begin, have the students come to seated tadasana (mountain pose). To twist to the left, students can cross the left thigh over the right. Instruct them to inhale and lengthen the spine and begin to twist to the left, bringing the left hand to the back of the chair’s seat. Have the student experience a gentle, even twist starting at the navel and rising up the spine, through the neck, to the top of the head. Be sure to have students come out of the twist with just as much gentleness as they employed going into it. Alternatively, if the chair doesn’t have arms, have the students sit sideways in the chair with their left arm (the one facing the chair back) resting alongside the body to begin. They can cross the legs (or not, if this is uncomfortable), then inhale to lengthen, and exhale to begin twisting to the left. They can place their hands gently on the back of the chair to stabilize the twist without using the strength of their arms to pull them deeper into the twist. This supine twist can be an effective way to open the low back and hips, as well as gently stretch the buttocks. Opening these areas can be helpful for sciatica or piriformis syndrome (which is often caused by tightness in the piriformis muscle in the buttocks). To support students in the pose, focus on having them ground through the upper back and shoulders. If the shoulders are lifting off the floor, then props can be used to raise the legs, or a blanket can be placed between the legs to create alignment in the hips. In the variation shown below, a blanket is folded so that it’s approximately the length of the lower leg and placed between the lower legs, from knees to ankles. This keeps the thighs parallel and reduces the twist because the upper leg is slightly elevated. The blanket also offers a buffer between the legs so there isn’t pressure on one leg from the weight of the other. Standing twists are a useful alternative for students who aren’t practicing on the floor. 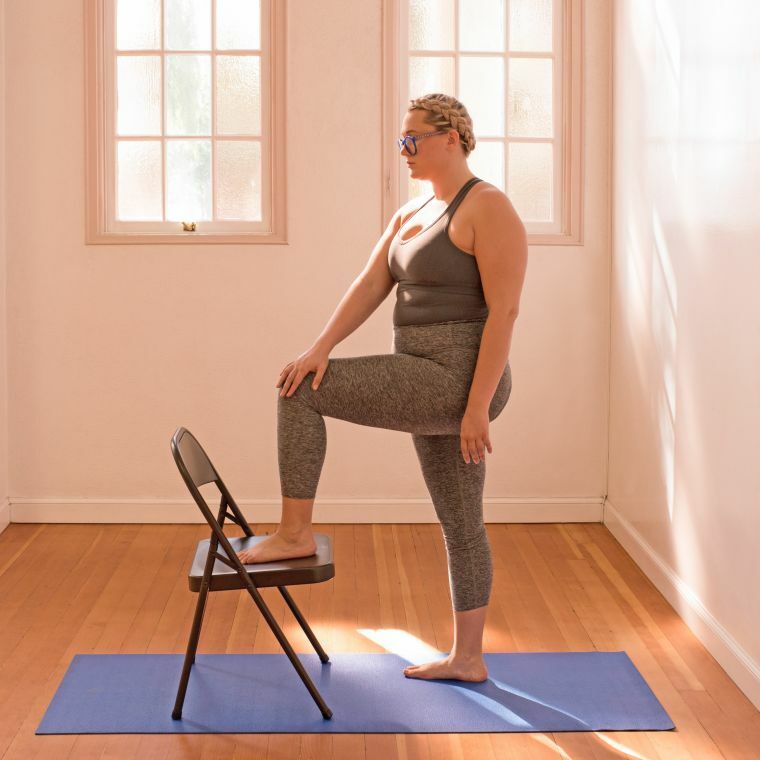 The students stand in tadasana facing a chair, approximately one foot away, and place their left foot on the seat of the chair. The right hand rests on the left thigh. As they inhale they lengthen the spine, and as they exhale they twist to the left. Allow the head to turn to the left so there is a gentle twist from the middle back through the neck. The left hand can come to the left hip. 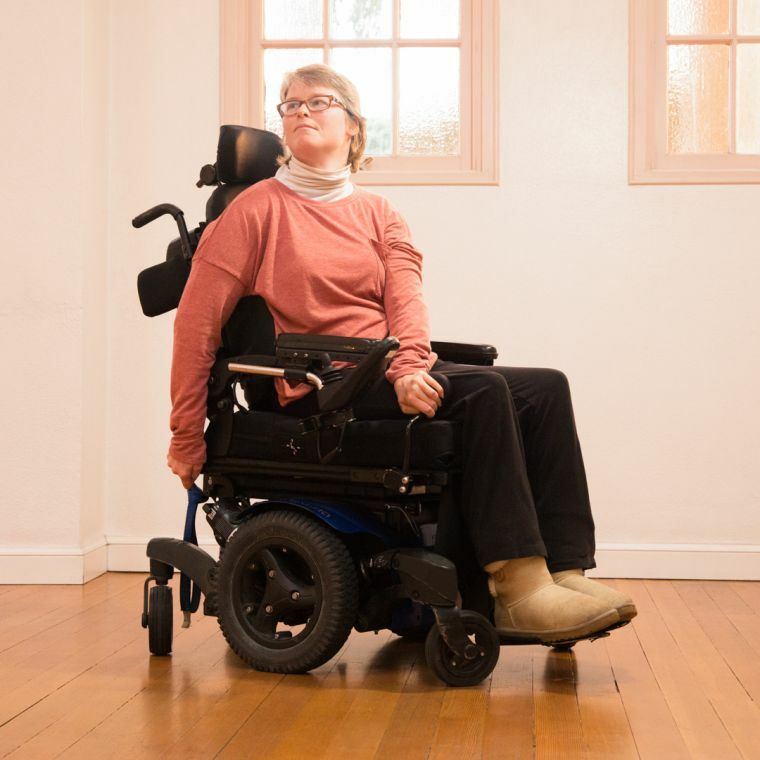 A standing twist can also be done using the wall instead of a chair. Have the students stand sideways to the wall with their left shoulder touching the wall to start. They inhale to lengthen the spine and exhale to twist to the left, placing their hands on the wall at shoulder height. To increase the stretch into the low back and buttocks, students can cross their left leg over the right and place the left foot on the floor outside the right foot.